The holy festival of Navratri is coming up this week. Navratri Festival is celebrated by Hindus with great devotion. Festival of Navratri is full of enthusiasm, happiness, lights, joy and festivity. Hindus celebrate this with devotion and enthusiasm throughout India. Navratri is composed of two Hindi Language word: ‘Nav’ and ‘Ratri’ where Nav means nine and Ratri means- night. Though the celebration is carried on for ten days. On the tenth day Goddess Durga, who is worshipped throughout the nine days, is immersed in holy water after pooja. The tenth day is also known as Vijayadashmi or Dussehra where the huge puppets of King Ravan, Kumbhkaran, Meghnaad are set on fire. Each and every day has its importance and meaning. People worship Goddess in three forms and try to enhance their physical, mental and spiritual practice in these nine days. People tend to play Dandiya and Garba. This festival is celebrated by all Hindus and has special significance in Gujarat. During Navaratri, we invoke the energy aspect of God in the form of the universal mother, commonly referred to as ” Durga,” which means the remover of miseries of life. She is also referred to as “Devi” (goddess) or “Shakti” (energy or power). It is this energy, which helps God to proceed with the work of creation, preservation and destruction. In other words, you can say that God is motionless, absolutely changeless, and the Divine Mother Durga does everything. Truly speaking, our worship of Shakti re-confirms the scientific theory that energy is imperishable. It cannot be created or destroyed. Some Hindus believe that every night one form of Goddess is worshipped while some believe that three forms of Goddess are worshipped and they are the trinity of God. 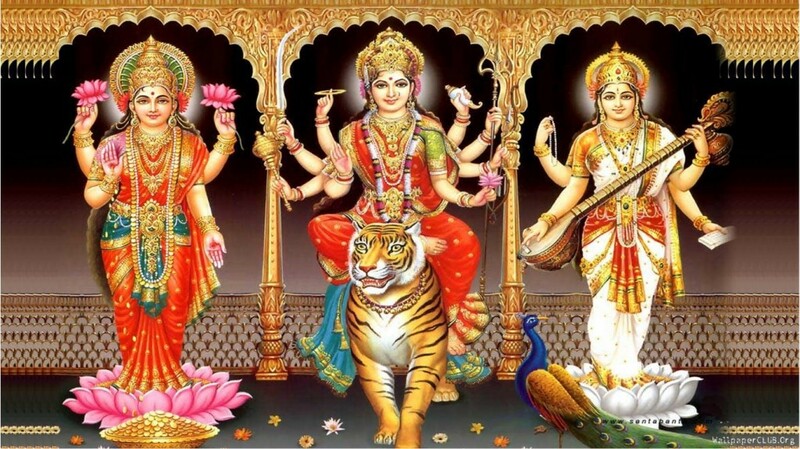 Navaratri is divided into sets of three days to adore different aspects of the supreme goddess. On the first three days, the Mother is invoked as a powerful force called Durga in order to destroy all our impurities, vices and defects. The next three days, the Mother is adored as a giver of spiritual wealth, Lakshmi, who is considered to have the power of bestowing on her devotees the inexhaustible wealth. The final set of three days is spent in worshipping the mother as the goddess of wisdom, Saraswati. In order have all-round success in life, we need the blessings of all three aspects of the divine mother; hence, the worship for nine nights. The Navratri celebration varies from one state to another although the dedication and devotion remain the same all over India. During Navratri, some people do not eat any non-vegetarian meal or even onion or garlic. They eat only fruits and drink milk during the entire nine days and nights. Some eat meal one time a day and have the fast rest of the day. People light a Jyot in front of Goddess Durga’s statue throughout the nine days and nights. They start the prayers with praying for Lord Ganesha and then perform aarti in front of Goddess Durga. People do not wear black clothes during this period and avoid keeping leather goods with them. People worship young girls (they are assumed to be the form of Goddess)and feed them with sweets and different types of traditional and delicious food items. Fasting commences on the ninth night of Navratri.